March 28, 2015: Ahead of the upcoming technical workshop of UN's Rotterdam Convention (RC) on white chrysotile asbestos scheduled during March 30-31, 2015 and 7th Conference of the Parties (COP7) of the UN's Rotterdam Convention (RC) in Geneva during May 12-15, 2015, National Human Rights Commissions’ observation and National Green Tribunal assumes great significance. Indian delegation must adhere to domestic law and should resist the unethical and immoral act of Mr. Vivek Chandra Rao Sripalle of Asbestos Cement Products Manufacturers’ Association (ACPMA) who has been included in the Provisional list of participants at the Technical workshop on chrysotile asbestos. India’s position at the last meeting of UN's Rotterdam Convention was inconsistent with domestic law. It is noteworthy that Part II of Schedule-I of the Manufacture, Storage and import of Hazardous Chemical Rules, 1989 under the Environment (Protection) Act, 1986 provides the List of Hazardous and Toxic Chemicals. This list has 429 chemicals. Asbestos is at the serial no. 28 in the list. 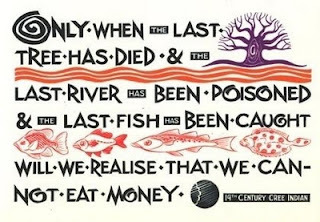 This Rule and the list is available on the website of Union Ministry of Environment & Forests. Government of India’s Inventory of Hazardous Chemicals Import in India that lists ‘asbestos’ at serial no. 26 as one of the 180 hazardous chemicals in international trade which is imported in India. These laws and official documents were ignored by the Indian delegation under the accompanying representatives of the chrysotile asbestos industry. In a significant development, National Human Rights Commission (NHRC) has taken cognizance of the fact that “the Union Ministry of Labour had expressed the opinion that the Govt. 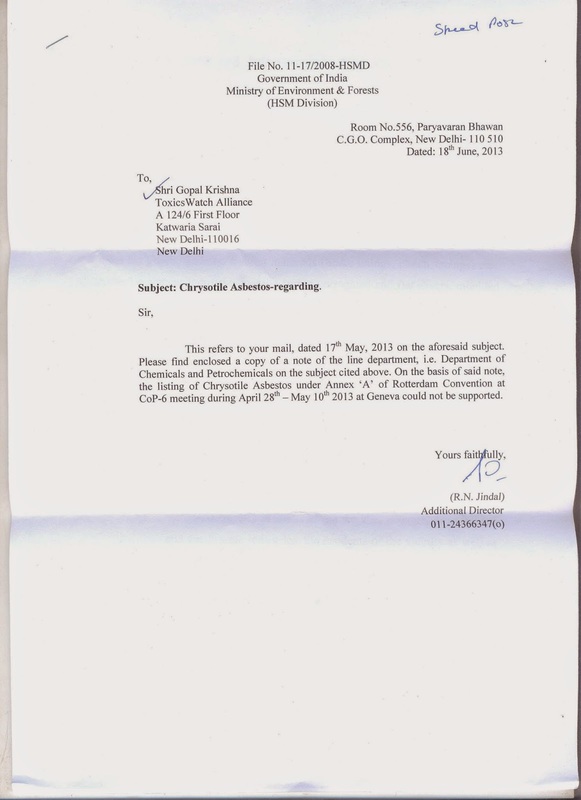 of India was considering the ban on use of Chrysotile Asbestos in India to protect the workers and the general population against primary and secondary exposure of Chrysotile form of Asbestos.” NHRC has sent a notice to “the Secretary, Ministry of Labour to give a report within six weeks as to whether any steps had been taken in this regard.” The attached NHRC document reveals the status as of March 28, 2015. NHRC’s directions reads: “The Hon'ble Supreme Court in Writ Petition (Civil) No.206 of 1986 had given the following directions- ‘1. To maintain and keep maintaining the health record of every worker up to a minimum period of 40 years from the beginning of the employment or 15 years after retirement or cessation of the employment whichever is later; 2. The Membrane Filter Test, to detect asbestos fibre should be adopted by all the factories or establishments at par with the Metalliferrous Mines Regulations, 1961; and Vienna Convention and Rules issued thereunder; 3. All the factories whether covered by the Employees State Insurance Act or Workmen's Compensation Act or otherwise are directed to compulsorily insure health coverage to every worker; 4. The Union and the State Governments are directed to review the standards of permissible exposure limit value of fibre/cc in tune with the international standards reducing the permissible contents as prayed in the writ petition referred to at the beginning. The review shall be continued after every 10 years and also as and when the I.L.O. gives directions in this behalf consistent with its recommendations or any Conventions; 5. The Union and all the State Governments are directed to consider inclusion of such of those small scale factory or factories or industries to protect health hazards of the worker engaged in the manufacture of asbestos or its ancillary produce’." NHRC has been seized with the matter since 2011 taking cognizance of a complaint alleging deaths of thousands of people die every year in the country due to Asbestos related cancer. The complainant has sought Commission's intervention for a ban on the use of Chrysotile Asbestos (White Asbestos), which is hazardous for the health of people and causes various incurable diseases. The white Asbestos is a fibrous material used for building roofs and walls and various in other forms. Citing contradictory position of the Government on the issue the complainant has alleged that though the mining of Asbestos has been technically banned by the government, but it allows its import and that too from the countries which do not prefer its domestic use. It is also alleged that white Asbestos is considered a hazardous chemical substance for environment by a number of countries in the world. However, it is being used in a number of industries in India affecting the workers employed their in. The complainant has also requested for grant of a compensation package for present and future victims of Asbestos diseases. The Commission had issued notices to the Secretaries of Ministries of Chemical Fertilizers, Environment and Forest, Health and Family Welfare, Industry and Commerce, Labour and Chief Secretaries of all the States/Union Territories calling for status reports. The replies of most of the concerned authorities have been received. The Commission is all set to announce its recommendations. In a related development Ministry of Environment, Forests and Climate Change and Ministry of Chemicals and Fertilizers has been informed about the Statement of some 100 scientists calling on the Government of India to withdraw a discredited scientific study on chrysotile (white) asbestos and to stop blocking the listing of chrysotile asbestos as a hazardous substance at an upcoming UN meeting. The ‘Study of Health Hazards / Environmental hazards resulting from use of Chrysotile variety of Asbestos in the country’, carried out by the National Institute of Occupational Health (India), states that it found no evidence that chrysotile asbestos is causing harm to health of workers in India. The Government is using the study as the reason why it will oppose the listing of chrysotile asbestos under the Rotterdam Convention at a UN conference in Geneva in May. The Convention sets safety standards to promote responsible trade in hazardous substances. It may be noted that “The study has no scientific credibility,” stated Dr. Philip Landrigan, President of the Collegium Ramazzini and Dean for Global Health, Icahn School of Medicine, Mount Sinai, New York. “It is flawed in the design, methodology and interpretation of the results,” he added. This statement is consistent with Supreme Court’s order and resolutions of ILO and WHO on chrysotile asbestos. The Tribunal took congnisance of the list of existing 38 asbestos mines listed at the page 174 -extract from lease directory in the State of Rajasthan. In response, the State of Rajasthan has filed a status report dated 23.02.2015 which is supported with the affidavit and the annexure giving the description of asbestos mines. According to this report, 32 asbestos mines listed at annexure page -3 are closed and as regards others it is revealed at paragraph-2 of the report that the same have asbestos in meager quantity and are intended to work with respect to some other minerals, namely, Abrasive granite, Quartz, Feldspar and as such no asbestos mining is going on in the State of Rajasthan. The status report speaks about the asbestos mining having been stopped. However, there is nothing to suggest that the asbestos mines which were formerly being mined for asbestos have been scientifically closed or not. The Government of Rajasthan shall file a report regarding scientifically closure of the asbestos mines and the instances of asbestos is in the State of Rajasthan till today. Referring to the affidavits filed on behalf of respondent no. 5 –Director of Mines and Geology, Government of Andhra Pradesh dated 26.02.2015, 26.08.2014 and the reply of respondent no. 8 –Andhra Pradesh Pollution Control Board dated 15.10.2014, learned Counsel appearing for the State of Andhra Pradesh submitted that there were only five asbestos mines operating in the State of Andhra Pradesh the operations of three of which have been suspended since January/February, 2014 and as regards other 2 closed long back prior to 2014 and there have been no cases of asbestos related cancer registered till April, 2012. Asbestos mining not only gives rise to asbestos related cancer but also to the asbestosis. The State of Andhra Pradesh has been asked to further elaborate as to the cases of asbestos is, if any, registered in the State of Andhra Pradesh till today. Tribunal was informed by the MoEF that there have been 42 asbestos mines in the State of Karnataka which are presently not functioning. However, it is not known that whether they have been scientifically closed or not. Issue Notice to the State of Karnataka and State of Jharkhand by registered post/acknowledgment due and Dasti as well. Notice to be served on the Resident Commissioners of the respective states. States of Karnataka and Jharkhand has been asked whether the asbestos mines have been closed scientifically or not and whether there have been any instances of asbestos is in their states. Last time India delegation relied on an irrelevant note of the Ministry of Chemicals prepared on the basis of an admittedly questionable study of NIOH study. (PIB Release attached) The ICMR Annual Report 2011-2012 reported the “Study of Hazards/Environmental Hazards resulting from use of Chrysotile variety of asbestos in the country (Ministry of Chemicals & Fertilizers, GOI)” as having been done. The Director, NIOH had sent a revised proposal on June 22, 2005 to Under Secretary. Department of Chemicals and Petrochemicals, Ministry of Chemicals and Fertilizers,Government of India to conduct the study. A reply from Shri R N Jindal, Union Ministry of Environment & Forests based on Department of Chemicals and Petrochemicals (DCPC)’s note dated June 18, 2013 on the issue of Government of India’s position on hazardous substance chrysotile asbestos at the Sixth Conference of Parties of (CoP-6) of the Rotterdam Convention on the Prior Informed Consent Procedure for Certain Hazardous Chemicals and Pesticides in International Trade held during April 28-May 10, 2013 in Switzerland. The 7 page long attached note of the Department of Chemicals and Petrochemicals (DCPC), Union Ministry of Chemicals and Fertilizers on the subject of Chrysotile Asbestos titled ‘Department of Chemicals and Petrochemicals’ View on the use of Chrysotile Asbestos” in the country’ was shared with me by the Union Ministry of Environment & Forests. MoEF’s contention based DCPC’s note stating that “On the basis of the said note, the listing of Chrysotile Asbestos under Annex ‘A’ of Rotterdam Convention at CoP-6 during April 28th -May 10th 2013 at Geneva could not be supported” is misplaced. The concluding sentence of the DCPC’s note saying, “In view of the above, India may take a stand in the next CoP meeting of Rotterdam Convention for not inclusion of chrysotile asbestos in Annexure-III of Convention. The flawed conclusion of the note titled ‘Department of Chemicals and Petrochemicals’ View on the use of Chrysotile Asbestos” in the country’ is quite stark and will not stand scrutiny of logic. The verdict of five judges of Japan’s Supreme Court of February 17, 2015 is quite relevant in this regard. It has upheld a ruling that found asbestos used at a plant of Kubota Corporation caused fatal mesothelioma in a man who lived near the plant and ordered the company to pay ¥31.9 million in damages to his relatives. The petitioners were relatives of Kojiro Yamauchi, who died at age 80 after working for two decades about 200 meters from the Kubota plant in Amagasaki, Hyogo Prefecture. His relatives and those of Ayako Yasui, who died at age 85 having lived about 1 km from the plant, sought damages from both Kubota and the government. In October, 2014 the Supreme Court ruled that the government was responsible for failing to protect workers from exposure at asbestos factories in Sennan, Osaka Prefecture. Meanwhile, Nepal has become the first country in South Asia which going in the direction of banning asbestos and joined more than 50 countries which have banned hazardous white chrysotile asbestos.